Lapsing on hamster cage cleaning doesn't just stink; it can make your hamster sick. Cleaning and disinfecting the habitat regularly is crucial to responsible ownership. Clean the cage at least once a week. Completely clean and disinfect the cage if your hamster becomes ill for any reason. Remove your hamster from his cage and place him in a safe enclosur, where he can stay while you clean and disinfect his cage. 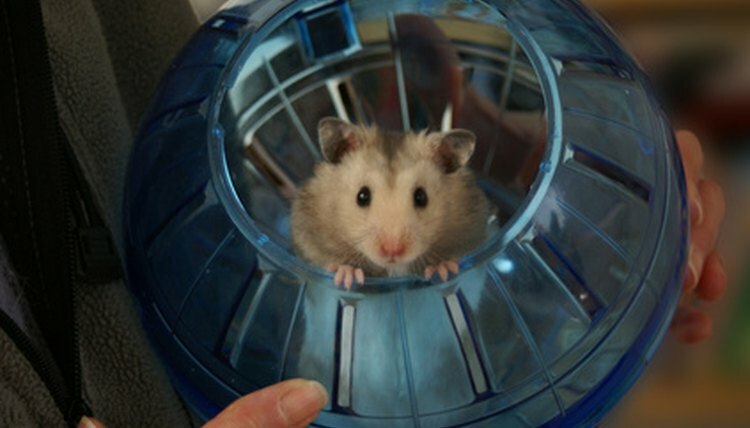 A second cage or a hamster exercise ball will contain your pet safely while you work. Remove everything from the cage, including water bottles, food dishes, exercise wheel, toys and bedding. Discard old bedding. Throw away any items that cannot be cleaned and sterilized. Fill your spray bottle with the disinfectant solution of your choice. Two tablespoons of bleach or antibacterial dish soap in a medium-size spray bottle will have enough cleaning power to disinfect the cage without being too harsh for your hamster. If you do not want to risk using chemicals around your hamster, clean the cage with white vinegar. Put white vinegar in a spray bottle without diluting it to disinfect the cage. Spray the solution over the cage and the toys you have removed from the cage. Make sure to thoroughly spray all the bars of the cage, as well as the floor. Cover all of your hamster's toys, dishes and exercise wheel with disinfectant. Use the washcloth to scrub everything thoroughly and remove all traces of dirt and grime. Allow the cage to air-dry completely, then place 2 inches of new, fresh bedding in your hamster's cage. Place all of the clean toys back in the cage. Refill your hamster's food and water. Return your hamster to his cage. ⚠ Using too much of a chemical disinfectant such as soap or bleach can leave behind residue that may be harmful to your hamster. If you are concerned that you have used too much disinfectant, rinse your hamster's cage with clean water before allowing it to dry and refilling it with your hamster's things.